Harmonic Records H/CD 9354 69 mins. 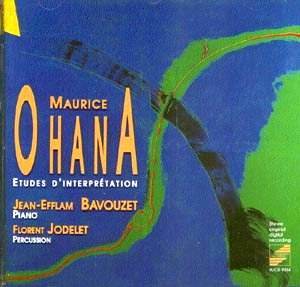 This is an important release in the posthumous discography of Maurice Ohana (1914-92). Shortly before his death I heard these studies in a memorable recital at St John's, Smith Square, given by Paul Roberts, dedicatee of the first book. For his pre-concert talk Ohana sat on the edge of the stage to talk and reminisce informally with the half dozen people who turned up. Genial and friendly, he showed no concern that he is so neglected in the country whose passport he holds. Cosmoplitan in the extreme, Ohana was an Andalusian of Jewish descent born in Morocco, educated in French and eventually established in Paris as a major French composer of the last century. Debussy influenced him above all 'classical' composers, also Chopin, Scarlatti, Albeniz & de Falla. Flamenco and Afro-American jazz contributed to his interest in micro-intervals, and many of his scores are schematic, leaving performers freedom for intuitive recreation. For the tempered piano, there is an early Sonatine monodique, 24 Preludes (1972/73) and a fine piano Concerto; also for harpsichord, Chiffres de Clavecin (1968) [timpani 1C1044 ****]. These Études are his greatest work for solo piano. The last two are elaborate duos with percussion, untuned metals 'detempering' the resonances of the piano, which are crucial throughout these expressive pieces, which deal primarily with musical, not technical, problems. Paul Roberts, author of an important book on Debussy's piano music, premiered the first six at South Bank Centre, London, in 1983 & the others were completed in 1985. There are comprehensive notes by Harry Halbreich, leading authority and champion of Ohana's music, from which I will draw upon a few passages. The first piece displays Ohana's 'emancipation from the fetters of metric rhythm and the bar-line'. The second has 'a sublime melodic line, played in parallel minor ninths, five octaves apart. The third is reminiscent of the Andalusian Saeta and the fourth, for the left hand, a homage to Ravel. No.5 is Quintes - four of Ohana's studies are based upon intervals, those which Debussy did not use in his own Études. The sixth explores the mysteries and enchantments produced with the Third Pedal. No.9 has 'four superimposed staves of non-coordinated and bar-less melodic lines'! The final duo, with skinned percussions predominating, deceives us into forgetting that the piano is an instrument with tempered pitch. The playing by Jean-Efflam Bavouzet sounds as sensitive as this music requires and seems completely authoritative; the booklet carries an accolade about him by the composer. The recording in the Royal Abbey of Fontevraud, Maine-et-Loire, 'achieved with the aid of an artificial head', is of demonstration quality, and the visual presentation, of all the information you could possibly want, is equally remarkable.